While most Internet users know about cookies, as word about their tracking capabilities have even reached mainstream news, only a minority seems to do use add-ons that improve cookie handling in web browsers. If you look at the user count of popular cookie management extensions for the Firefox web browser for instance, you will notice that they are in the thousands or even less usually, with only a handful reaching six digit user counts. A lot of tracking can be disabled by turning off third-party cookies in Firefox, and that may be what Firefox users do. But disabling third-party cookies has disadvantages as some sites fail to load properly or at all when third-party cookies are not enabled. 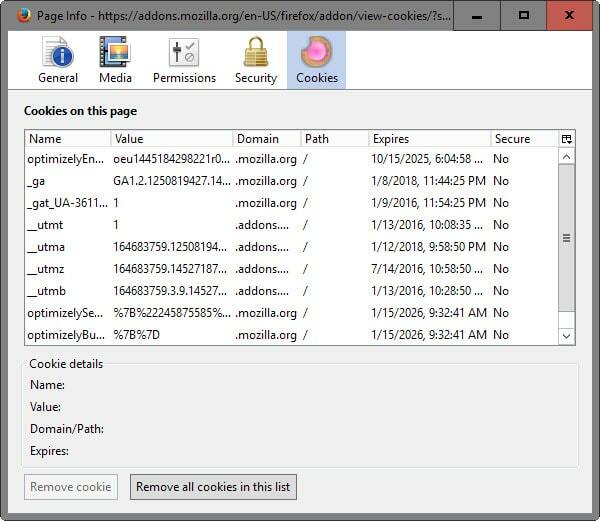 The following guide looks at cookie management add-ons for the Firefox web browser. While all of these add-ons have in common that they provide you with better cookie handling in the browser, you will notice that they may serve very different purposes. 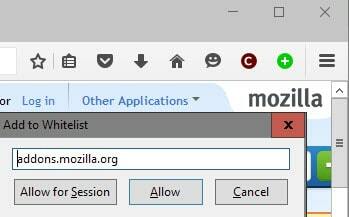 Mozilla disabled the classic add-on system of Firefox in version 57. The following extensions are compatible with Firefox 57 and newer. Cookie AutoDelete -- Inspired by Self-Destructing Cookies. Designed to delete cookies as soon as you close the browser tab. Features lots of useful options to automate cookie deleting and management. Cookie Quick Manager -- Lists all set cookies in Firefox. Enables you to view, edit, create, delete and backup/restore cookies. Features search functionality and supports private browsing. Cookie Manager -- The extension lists all set cookies in Firefox and displays values for each. You can remove individual cookies or cookies based on patterns. It supports adding and editing cookies, and Firefox for Android. All add-ons listed below have been tested in Firefox Stable. They are compatible with Firefox 56 and earlier only. Some add-ons handle cookies automatically for you based on an initial configuration. It is usually required to configure them once, but once that is out of the way they will act on those rules automatically. 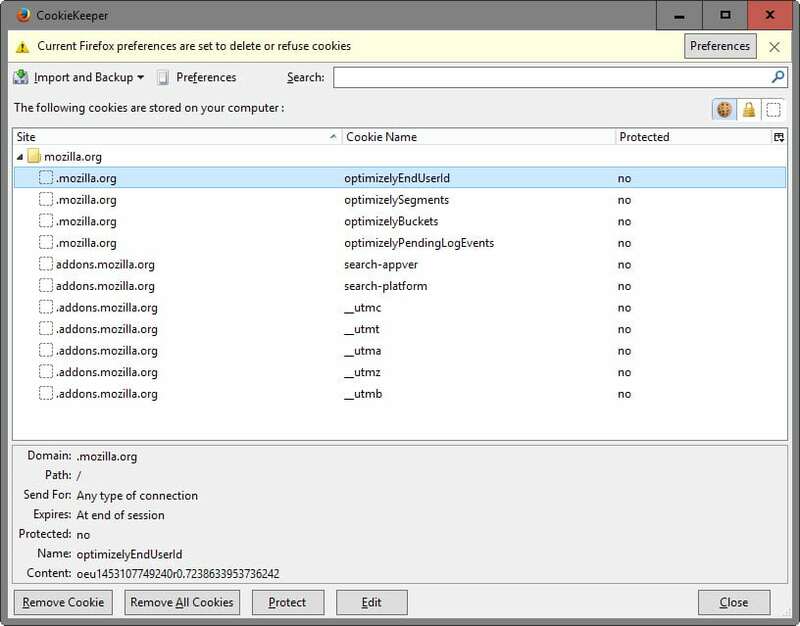 Cookie Time removes expired and unused cookies automatically from Firefox based on your preferences. You use it to delete cookies that have not been used for a certain period and expired cookies, and enables you to set a custom cookies expiration time. Protect cookies that you want to keep to clear all other cookies on exit. Offers extensive control options that allow you to control its functionality and the basic cookie settings that Firefox ships with. One interesting feature that it adds is a lifetime policy that you can use to change how long cookies are kept active by default. New options provided allow you to limit the lifetime to x days, or to downgrade it to the active session directly. The main idea behind self-destructing cookies is to allow cookies on sites but delete them as soon as you leave it. This ensures maximum compatibility with sites you visit and protection against cookie-based or local-storage-based tracking at the same time. The extension supports a whitelist to protect certain cookies from being deleted by it. This is useful considering that cookies are used to keep you logged in to web services among other things. Add-ons listed under controls provide you with options to enable or disable cookies, or display information about cookies. The add-on offers one-click cookie controls for the active website and general cookie permissions that you can manage from its toolbar button. You may use it to view cookies, configure how third-party cookies should be handles, or change current cookie permissions with a simple click of the mouse button. 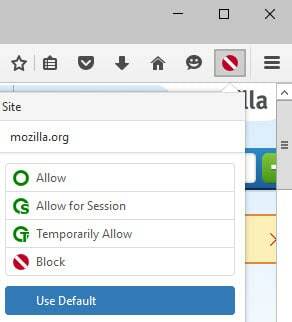 The Firefox add-on displays a cookie permissions menu when you click on the icon it adds to the browser. It allows you to set cookie permissions for the root domain only, which limits its use somewhat as you cannot set permissions for subdomains individually using it. 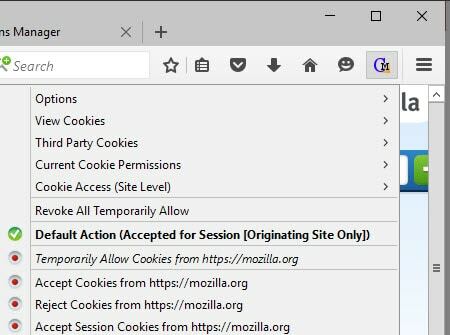 The add-on sets Firefox to reject cookies from all sources by default. You use the button it adds to the Firefox toolbar to allow websites you visit to set cookies on your system. Options are provided to allow for the session, or permanently. The extension gives you full control over the cookies of a site you visit. A click on the add-on button displays a window which you use to allow, block or remove cookies for the site you are on. 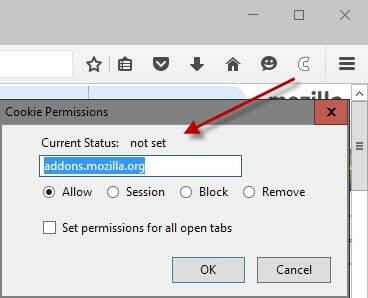 In addition, you may set the selected permission for all open tabs directly. The following add-ons for Firefox add better cookie viewing, editing and creation options to the browser. 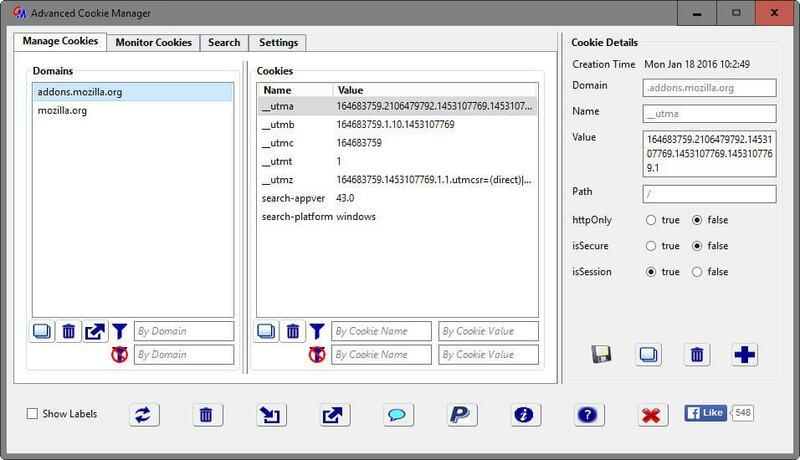 This massive add-on enables you to add, delete or modify cookies among other things. One interesting feature that it ships with is cookie monitoring which displays a cookie history in the add-ons interface highlighting all cookies that were added or modified in the browser. Browse, edit and create cookies as you see fit using the extension. It ships with an incredible feature set especially when it comes to editing cookies. It allows you to modify any value of the cookie including its content, host and expiration date. Add-ons listed under this category provide a variety of features that don't fall into the other categories. Export or import cookies based on Netscape's standard. Great to move cookies from one browser to another among other things. A simple add-on that you can use to remove all cookies set by the active site. A simple browser add-on that displays all cookies set by the active site. The add-on adds the information to the Page Info dialog which you can open with a right-click on the content area of the page you are on. Now You: Do you use cookie management add-ons in Firefox? 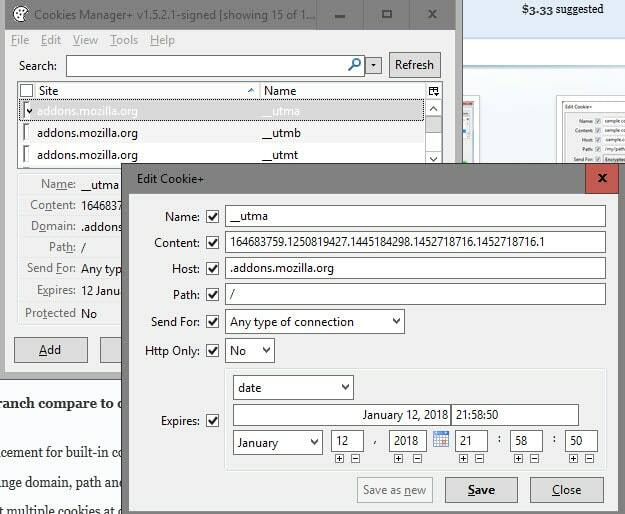 The guide provides you with an overview of Firefox cookie management add-ons that improve how you work with cookies in Firefox. >>Do you use cookie management add-ons in Firefox? No apart from managing allowable to load scripts and content from third parties. Cookies schmookies. If Cookie Controller had a “Delete Cookies after Tab Close” option similar to Self-Destructing Cookies, I would probably switch to using this. Yep, I just use the options in Firefox to block 3rd party cookies and delete cookies when I close Firefox. If a site won’t load / load properly without 3rd party cookies I go elsewhere. Nice collection! I never new of so much Cookie Management add-ons!? I personally use “Self Destructing Cookies” and “I don’t care about cookies” in Pale Moon. Love these two and their developers for kindly working with us so support can be continued. Hmmm……. So much to choose from! I think I’ll try Cookie Monster. ‘Self-Destructing Cookies’ and ‘Permit Cookies 2’ here. The former would be sufficient but it misses 2 options : Block (cookie) and Remove (exception rule), maybe because implicitly it considers that a non-allowed cookie being removed once the site closed doesn’t require an option to block it, with which I disagree. And removing an exception rule (allow, blocked, session) is more practical than having to manually remove it from Options. ‘Self-Destructing Cookies’ is IMO the ultimate cookie management solution. Set in Firefox’s Options cookies’ permission to Accept cookies from sites … ‘until I close Firefox’ OR ‘until they expire’ has no importance with this add-on, as long as you check ‘Accept cookies’ (BTW I refuse 3rd-party cookies with no issue up to now, otherwise I’d boycott the place). The site will carry on normally with its cookies and they will be removed once the site is closed UNLESS I have set an Allow exception for that site : how can it possibly be any easier? Moreover, ‘Self-Destructing Cookies’ handles LocalStorage as an option, which means that, if the option is checked AND if I have NOT set an ‘Allow’ exception for that domain, any data the site would have injected into LocalStorage will be removed as well : how can it be more complete? 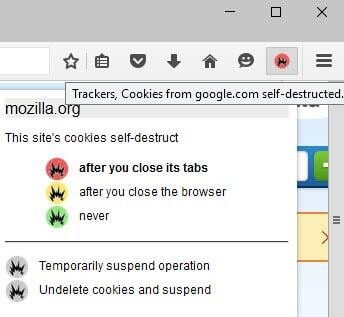 It can be even more complete : ‘Self-Destructing Cookies’ even includes an option to Clear Browser Cache when idle, with a user option on (with delay) or off : the ultimate. No need to search anywhere else : ‘Self-Destructing Cookies’ does it all, no bloat, no deep thoughts, simple, obvious. Still, ‘Permit Cookies 2’ adds an extra ease of management for the reasons mentioned above. Together they fulfill 100% of functionality and ease of use. Does it still zap all your protected cookies on install ? I’ve never encountered this issue but I’ve read about it already. My guess is that cookies removed after install of ‘Self-Destructing Cookies’ had been so because they were not protected. If a cookie has been set with the exception rule to ‘Allow’ (Firefox / Options / Privacy / History -> Exceptions) then ‘Self-Destructing Cookies’ cannot and will not zap it. So : if you install ‘Self-Destructing Cookies’ before doing so have a look at your Exceptions list and see what cookies are set to ‘Allow’ : all cookies not set to ‘Allow’ will be removed by ‘Self-Destructing Cookies’ since that’s the way the add-on works. To be noted : latest Firefox cookies management concerning Exceptions : a site (domain or sub-domain) has to be set as ‘Allow’, ‘Allow for session’ or ‘Blocked’ for both http AND https. Not sure how ‘Self-Destructing Cookies’ will react if it notices an ‘Allow’ for http or https only. But once you run ‘Self-Destructing Cookies’ and choose from within its toolbar button to Allow a site then it will register it with http and https correctly. One thing that is missing for me when using Self-Destructing Cookies is an option to persist or protect specific cookies. I once requested this option to the SDC dev, but he stated that he doesn’t plan on including this as a feature. If anyone knows of an addon that protects specific cookies while working with SDC or any other cookie addon, please let me know. I’ve tried several addons in the past like Biscuit and Cookie Keeper, but they do not gel with SDC. @Ray, I don’t understand your point. The whole deal with ‘Self-Destructing Cookies’ is to keep the cookies you want and to have the others removed when you exit a site. If you please, read either the add-on’s description on AMO either my comment above. SDC purges all cookies for a site. I want to keep specific cookies enabled for certain sites, while having the rest of them deleted. SDC doesn’t handle this. It’s not a big deal since I would only need to do this on one or two sites. Was just a nice-to-have. @Jimbo: If I understand your question, yes, it deletes cookies when you install it. But it also allows you to undelete them if desired. There is a help screen that appears the first time you use the addon to guide you through this. Ray, you may want to use SDC in conjuction with Ccleaner as I’ve been doing up until now. Specify cookies outside of SDC you want to keep in Ccleaner as “cookies to keep”. I also take cautions not to delete cookies from within Firefox’s command, as I suspect other cookies unprotected by SDC would be deleted as well if a deletion was performed from within Firefox. When I wanted to purge cookies I do it via Ccleaner. I believe alternatively you may need to specifiy and include all cookies you want to keep under the “Allow” command of SDC so they won’t be deleted. CookieKeeper comes close to what I want, but doesn’t have the auto-delete feature. CK also handles local storage, which is a plus. I did see the auto-delete feature on the roadmap though, which is promising. Thanks for this article. Currently I’m using Selective Cookie Delete but it has been abandoned for years and I wanted to replace it for some time. Will look into the addons you presented. Would be nice to know what addons also remove HTML5 storage, as it also gets flooded a lot. Is HTML storage the same as flashcookies? HTML5 storage is also called DOM storage and a new HTML 5 technology. Its in the webappstore.sqlite file in your FF profile and handled by the browser. I use the addon “Volatile Storage” to delete them on click. You would be surprised how much stuff is in there. Flashcookies are handled by the flash plugin (and only work if you have it and flash enabled for that site). They get stored somewhere in the flash folder \appdata\roaming\macromedia (or so). As far as I know, FF can use the built-in (in flash) API to delete them, when erasing your browser history. So maybe some of those addons can also use this(?). I use your exact same set up: Selective Cookie Delete + Volatile Storage. I also use Self-Destructing Cookies and Cookie Time as well, but when I have a ton of tabs open, SCD and VD are a good combo. CookieKeeper also handles HTML5 storage, however lacks the ability to whitelist based on site. You have to manually whitelist each individual cookie and local storage option to keep. Older versions had an animated icon when cookies were deleted which isn’t a feature anymore. I liked the animation as I could check it was working correctly. That’s because of Australis. It’s still animated in Pale Moon. I tried many cookie manager extensions, now I use Cookie Fast, simple, light and complete. “I don’t care about cookies” is new to me. I will definitely check it out. I only use the add-on “better privacy”, everything else I manage via the build-in firefox privacysettings. i’m only asked to allow 3rd party cookies when i log into my bank account. “I don’t care about cookies” concerns the crappy, stupid, insane EU Cookie regulation law. If your IP is out of Europe this add-on is nonsense, if you are within the EU community, ‘uBlock Origin’, ‘AdBlocker Plus’ add-ons can be fed with dedicated anti-EU cookie notification filters, much swifter and less heavy than this add-on which by the way doesn’t handle all situations. It is quite annoying how we have to install some third party add-on to accomplish such a basic task. If I was a browser developer my priority will be a big red visible button saying “clean all that crap in one click”! There’s also Crap Cleaner … simple, effective, clear. That’s not a Firefox addon though and requires opening another program. Ben, thank you for ‘Volatile Storage’…didn’t know about this,. I use Maxa Cookie Manager (from developer’s site only). Separate program, but it deletes IE history. Always wondered, even if you don’t use IE, good idea to clear it !?! appreciate that you took time to answer me. The best and most comprehensive addons of this nature that I have found is uMatrix. It manages cookies and scripts like a boss. Many thanks Martin for this article. SDC – Cookies were still there after I left the website. Needs to be upgraded. Cookie Shield & Cookie Monster – Both don’t remember the permission rule I set, which is annoying because I have to set again every time I visit a website. But by then the cookie has already been placed and I have to remove it manually. Cookie Keeper – Has great potential but it needs to be upgraded. The “Ask before accepting” in the preferences doesn’t work. Too bad a lot third party programs disappeared about twelve years ago because there were some good ones. Maybe it’s time to bring them back because I really hate unwanted cookies. Part of Firefox’s appeal stems from its powerful add-ons system, which allows users to install plug-ins that add to the browser’s functionality. Here are 40 extensions that will turbocharge your surfing experience. By automating tasks, providing more control over how websites are displayed, and adding new ways to search for information, these extensions will make Firefox faster and easier to use.